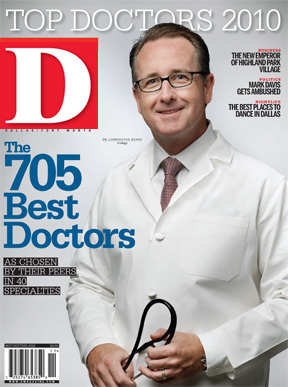 By D Magazine | 9 years ago The top 705 physicians in 40 specialties as voted by their peers. By Joseph Guinto | 9 years ago Ray Washburne has taken the throne of the ritzy shopping center, where even his subjects seem to love him. By Sarah Reiss | 9 years ago Whether you’re in the mood for western or salsa, here’s where you can get moving. By D Magazine | 9 years ago Local physicians share their most challenging moments in medicine. By Lauren Silva Laughlin | 9 years ago If a major catastrophe hit North Texas, our hospitals wouldn’t be able to handle it. Now the state has its hands on the money earmarked to fix the problem. By Moira Muldoon | 9 years ago Raise a martini glass to a bit of Dallas history. By Barrett Brown | 9 years ago A wholly unfair commentary on Dallas’ most influential conservative commentator. By Andrew Marton | 9 years ago As Dallas decides this month whether to get wet, the alcohol business booms to the north. Can Scientists Believe in God? By Merrie Spaeth | 9 years ago Dr. Daniel W. Foster is well-known in medicine, but not universally liked for his embrace of faith. By Joseph Capasso | 9 years ago A map of geo-tagged online photos shows Dallas’ biggest attraction. By Courtney Sinelli | 9 years ago Five shops with designer collections you'll find nowhere else in town. By Nancy Nichols | 9 years ago The fountain view is the highlight of this uninspired dining experience. By Teresa Gubbins | 9 years ago This extraordinary McKinney restaurant is so much more than tapas. By Nancy Nichols | 9 years ago Dishes from El Salvador are the way to go at this new Latin watering hole on Lemmon. By Nancy Nichols | 9 years ago The old haunt finally reopens—and struggles with its past. By Allison Hatfield | 9 years ago Is the new dog I ordered from San Miguel de Allende my new best friend — or a drug mule? By Jeanne Prejean | 9 years ago Arts supporters bid big at these black tie events. By Jeanne Prejean | 9 years ago Stanley Korshak and Neiman Marcus trot out their new looks for the social set. By Terry Murphy | 9 years ago When John F. Kennedy was shot, the issue was sacked. We've uncovered it. By Krista Nightengale | 9 years ago This resort town in the Canadian Rockies is low-key and tucked away in the wilderness. By Peter Simek | 9 years ago Josh Glover didn’t want to wait 15 years to break into a local company. So he created his own. Why Can’t You Find a Parking Spot on Henderson? By Patrick Kennedy | 9 years ago Don't blame the business when you're forced to valet (and wait for your car's return). Blame the city of Dallas. By Wick Allison | 9 years ago Straight-ticket voting by Democrats and Republicans is filling the local bench with petty tyrants, crooks, and incompetents. By Zac Crain | 9 years ago He's played basketball for only six seasons, but he's bringing change we can believe in. By Willard Spiegelman | 9 years ago The C&W danceclub has been open for boot-scootin' greatness for nearly 30 years.